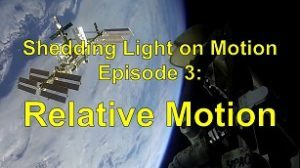 With brilliant visuals, engaging explanations, and outstanding animations, science teacher Spiro Liacos leads students from the swimming pool into space and from the depths of the ocean to the end of the rainbow for a fascinating look into refraction and total internal reflection. The basic theory of these two phenomena is covered and then numerous examples are given of how each phenomenon affects us. 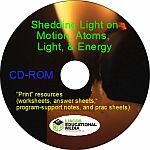 With excellent teacher notes, well-laid-out question sheets and two practical activities, this is not just a fantastic video, it’s also a series of fantastic lessons for your students. The preview video below contains a 2-minute trailer followed by a 5-minute excerpt. Part C: Refraction and Perception: refraction changes the appearance of things if light has to travel from, say, water to air to reach your eyes… watch out for the 5-metre shark! Part A: An Introduction to Refraction. Refraction! It’s a word that that hardly ever gets used, but light is constantly refracting all around us, and affecting what we see, and how we see. In fact, without refraction, seeing anything at all just wouldn’t be possible. So what is refraction and how exactly does it affect us? Well I’ll begin by saying that light beams usually travel in straight lines. When they hit a reflective surface, they reflect and change direction and we call this reflection. “Refraction” also involves a light beam changing direction, but refraction is the changing of a light beam’s direction when it travels from one transparent substance to another. For example, air, water, glass and many types of plastics are said to be transparent because light can pass through these materials and we can see what’s on the other side. But, whenever a light beam does pass from one transparent material to another at an angle, the light beam changes direction, that is, it refracts. Here, for example, the light beam traveling in the air hits a glass block at an angle and then changes direction, or bends, when it enters the glass block. The light beam has refracted. When the light beam then hits the other side of the glass block it passes from the glass block to the air and so it changes direction again. The light beam has refracted again. 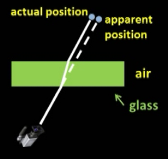 In fact, in this case, the light coming out of the glass bends back the same amount as it had bent when it entered the glass, so the beam ends up travelling parallel to its original direction, but slightly displaced. So why does refraction occur? Why does a light beam change direction when it goes from say air to water? Refraction occurs because light travels at different speeds in different substances. In a vacuum for example, no, not a vacuum cleaner, a vacuum, which is a space which has no air or any else in it, like what you’d find up in space, light travels at a speed of 300,000 km/s (although if you want to be really accurate it’s actually closer to 299,792 km/s). 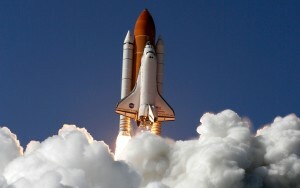 In air, light also travels at close enough to 300,000km/s, but slightly slower than what it does in a vacuum. 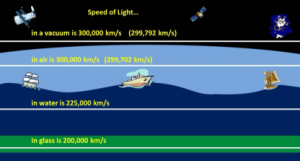 Through water, light travels relatively slowly at about 225,000 km/s. While through glass, in for example windows or optical fibre cables which we’ll be talking about later, it travels at only about 200,000 km/s. So if the light beam is travelling at 300,000km/s in the air and it hits glass, the side of the beam that hits first will slow down, while the other side still travelling through the air, keeps going at the same speed until it too hits the glass. The light beam therefore swings around. 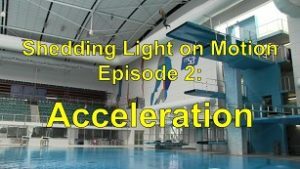 When a light beam goes from glass to air, the side of the light beam that hits the air first will speed up first so the light beam bends the other way. One of the easiest ways of remembering which way the light beam bends is to think of a billy cart. 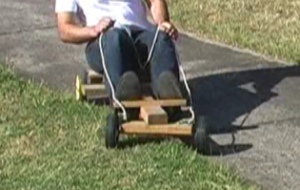 A billy cart can travel fairly fast on concrete but travels fairly slowly on grass. When the billy cart moves from the concrete to the grass at an angle, the wheel that hits the grass first will slow down first while the wheel still on the concrete moves at the same speed until it too hits the grass. The billy cart therefore changes direction. When the billy cart goes the other way from the slow grass to the fast concrete, it changes direction again but this time the other way. The light ray coming in is called the incident ray, and the angle between the normal line and the incident ray is called the angle of incidence. The normal line is the imaginary line at right angles to the surface where the light ray hits. In the diagram, the angle of incidence is 50 degrees. The light that passes into the second substance is called the refracted ray and the angle between it and the normal is called the angle of refraction. Here the angle of refraction is 31 degrees. 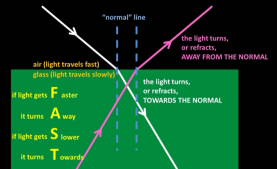 To describe which way the light turns, we use the expression “towards the normal” or “away from the normal”. We’re not talking about the direction of the light beam but rather about which way it turns. This car for example first turns towards the normal and then turns away from the normal. When light passes from one substance to another at an angle and slows down, it turns, or refracts, towards the normal. When light passes from one substance to another at an angle and speeds up, it is said to turn, or refract, away from the normal. You can use the simple mnemonic FAST to help you remember it. 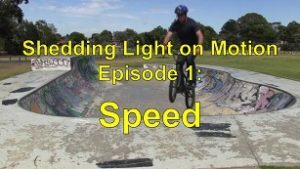 If the light gets FASTER it turns AWAY from the normal, but if it gets SLOWER it turns TOWARDS the normal. And what happens if the light beam strikes at an angle of incidence of 0 degrees? The light ray still changes speed, but it doesn’t change direction. Now since the speed of light is so huge, scientists often use what’s called the refractive index of the material in their calculations. The refractive index of water = the speed of light in a vacuum / the speed of light in water, so it equals 300, 000 km/s / 225,000 km/s which equals 1.33.Let’s take water as an example. The expression “optical density” is sometimes used instead of refractive index. Someone might say that glass is more optically dense than water for example. Optical density, which has nothing to do with physical density, is basically the same as refractive index, but it’s not used in equations. The letter “n” is used as the symbol for refractive index. So, in scientific language, we would write for example nwater = 1.33 and we would pronounce it as “the refractive index of water = 1.33. The refractive index of glass = the speed of light in a vacuum / the speed of light in glass, which equals 1.5. This is how we would write it: nglass = 1.5. A vacuum by definition has a refractive index of exactly 1 and the refractive index of air, is also 1 since the speed of light in air is pretty much the same as it is in a vacuum. When light goes from a lower refractive index material to a higher refractive index material, it slows down and turns towards the normal, and when it goes from a higher refractive index material to a lower refractive index material it speeds up and turns away from the normal. And if you can’t remember all that, just think billy carts. 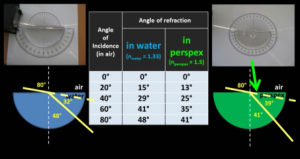 So let’s have a look at some of the actual angles involved when light travels from air into water and from air into perspex which is a type of plastic that has a similar refractive index to glass. 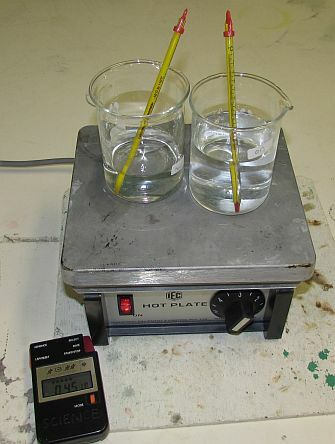 At an angle of incidence of 0 degrees in the air, the angle of refraction in water is of course 0 degrees and it’s zero degrees in perspex as well. At an incident angle of 20 degrees in air, the angle of refraction in water is about 15 degrees while in perspex it’s about 13 degrees. At an incident angle of 40 degrees in air, the angle of refraction in water is about 29 degrees while in perspex it’s about 25 degrees. As we increase the angle of incidence, the angle of refraction also increases, but the light refracts more in perspex than it does in water. When the incident angle is 80 degrees in air, the angle of refraction in water is 48 degrees, while in perspex it’s about 41 degrees. 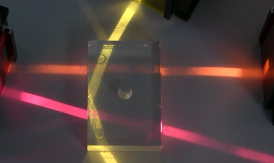 At an incident angle of 80 degrees, the light beam deviates, or turns by 32 degrees when it enters water, but it deviates by 39 degrees when it enters perspex. As you can see, the more the light slows down, the more the light beam refracts. Or, to put it another way, the greater the refractive index difference between the two materials that the light travels in, the greater the refraction of the light ray. Now it was by studying refraction that scientists discovered that white light is actually a mixture of lots of different colours, the colours in fact of the rainbow: red, orange, yellow, green blue, indigo and violet. 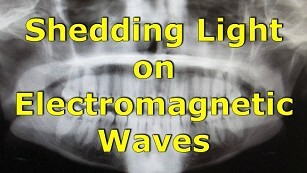 When a beam of white light refracts, each colour refracts by a slightly different amount. Normally the difference isn’t noticeable, but when the light refracts a lot, the individual colours spread out. 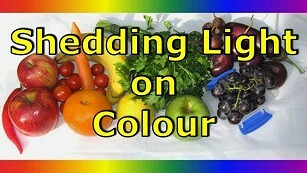 This spreading of the component colours of white light when white light refracts is called “dispersion”. The dispersion in the diagram has been exaggerated. The refraction of light affects the way we see things. Whenever we see something, what we’re really seeing is the light that is coming from it. We can’t really tell where the light originated from; we can only tell the last direction the light was travelling in when it entered our eyes. If the light rays have changed direction on the way from the object to our eyes, then the object appears to be in a different position to where it really is. The light rays coming from the lower half of my face had to pass through the water to get to the camera. Because of refraction they ended up entering the camera from a direction to the right of where my face actually was, so it looked as if my face was split in two. Light coming through a sheet of glass like the windscreen of a car or a window, does much the same thing, but to a much smaller extent. Here it looks as if the part of the metal rod that’s behind the glass is to the right of where it actually is. When the light enters the glass, it refracts and then, when it exits the glass, it refracts back again, so that it ends up travelling parallel to, but to the right of, its original direction. So this is where the rod appears to be. This also happened to the light rays coming from the top half of my face in the previous scene. But, even with a slab of glass that’s much thicker than a typical window, the light isn’t displaced by all that much. More glass though increases the shift. Everything you see through a car’s windscreen, when the light hits it at an angle is therefore not exactly where it appears to be, but because the glass is so thin, it’s only displaced by a very small distance. Let’s have a look at a few more examples. This is a 1m length of timber, half of which we’ve painted yellow. The light reflecting from it isn’t changing direction once it reflects from the timber, so the timber is in fact exactly where it appears to be. If I now place the painted half into the water, the timber doesn’t seem to be divided in half anymore. Why not? Because of refraction. Sunlight that hits the timber reflects off in every direction of course, but the camera will only detect light that enters the camera. The light coming from the bottom of the timber that moves directly towards the camera never actually reaches the camera because it refracts away from the normal when it hits the air, and misses the camera. 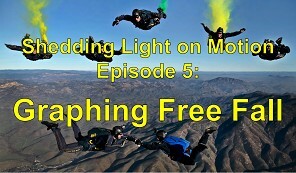 In fact, it’s light travelling upwards in this direction that eventually reaches the camera. The light ray refracts away from the normal when it hits the air and then heads directly for the camera, and it’s this light that the camera detects. But this light appears to be coming from along this line of sight, or in other words, from about here, so in fact the part of the timber that’s underwater seems to be shorter than it really is. The light is still coming from here, but it seems to be coming from here. Though the bottom of the timber is 50cm below the surface of the water, it seems to be only about 10cm or so below the surface. By placing two identical rulers next to each other in two identical containers, we can see that, from this viewing angle, the part of the ruler underwater appears to be about 30% shorter than it really is. The exact appearance changes depending on your viewing angle: from this viewing angle it’s more than 50% shorter. From above, there’s not much difference, because the light coming from the bottom of the ruler travels almost straight up and doesn’t refract much; as your angle gets lower, the distortion increases, because the light refracts more. Because of refraction, when viewed from an angle, all swimming pools appear to be shallower than they really are. When I’m standing out of the water, I’d like to think that my proportions are fairly normal. When my legs are in the water though, things aren’t quite right. My head and torso obviously look the same, but my hips and legs clearly don’t. Refraction is also responsible for giving things a bent appearance when they’re placed in water. Here, the bottom of the timber is actually about 40cm below the surface of the water, but it appears to be only about 20cm below. 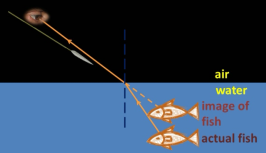 If you ever go spear fishing, refraction causes a fish underwater to appear to be in a different position to where it really is so if you want to spear the fish, you can’t aim your spear directly at the fish. If you do, you’ll be disappointed. If the fish is actually here, the light travels upwards and refracts away from the normal. 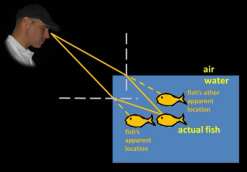 Our eyes therefore point along this line of sight, which continues along this line and so the light appears to be coming from here, and this is where the fish appears to be. If you aim here, you’ll miss. To spear the fish, you have to ignore where you see the fish and aim lower than where you see the fish. Here, it looks like I’m going to miss the fish, but in fact, I won’t. This isn’t a real fish by the way. I wonder what modelling clay tastes like. Of course if you’re directly above the fish the light doesn’t refract when it travels straight up out of the water, but how often is a real fish going to let you get this close? Refraction and reflection are responsible for what we’re seeing here. How many fish are we actually looking at? Well, we can see the images of the fish here because of the reflection off the glass. But are the fish we see in the tank doing some synchronised swimming or are we seeing double? Let’s look at what’s happening from the side. The light beam heading in this direction ends up refracting away from the normal, since it’s passing from water to air and speeding up, and then moves upwards towards our eyes. This is the light we see. Since we have to look along this line of sight, the fish appears to be here. However, this light beam heading upwards, also refracts away from the normal and enters our eye, so it appears as if there’s another fish here. From certain angles, one fish appears to be two fish. When you go snorkelling, refraction occurs when light passes from the water into the air gap between your mask and your eyes. This has the effect of making everything look bigger than it really is. You often don’t really notice it though, because everything has been enlarged. Let’s say you’re looking at a shark underwater. 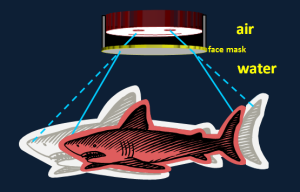 The light coming from the shark’s head, travels upwards towards your mask and then refracts away from the normal into your eyes. It therefore appears to be coming from here somewhere. The light coming from the shark’s tail travels upwards and again refracts away from the normal, so it appears to have come from somewhere around here, and the whole shark of course appears here, larger than it really is. Real size, apparent size. So if you’re ever snorkelling and you see a five metre shark, you can relax: it’s probably just a 4m shark. In all seriousness though, they say that you should never swim or dive alone just in case you get into trouble. If nothing else it increases your chances that it won’t be you that gets eaten. 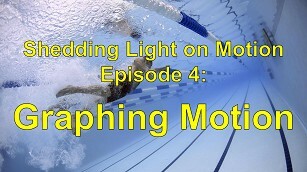 Underwater cameras also have an air gap between the protective glass and the lens. Above water, our scene is 7 tiles wide. When the camera moves underwater, the tiles seem to be larger and only 5 tiles now fit across our scene. Now it’s because of refraction that we have lenses. A lens is a piece of transparent material that is curved in a specific way. Lenses can refract light inwards to a focal point or refract light in a way that makes the rays diverge. Lenses can be found in cameras and in our eyes. 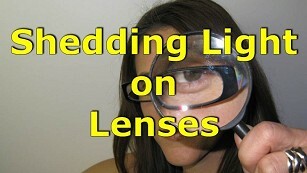 They’re so important to us that the whole of our next video Shedding Light on Lenses is devoted to them. 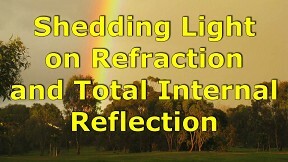 For now though, we’re going to take a look at something related to Refraction called Total Internal Reflection. 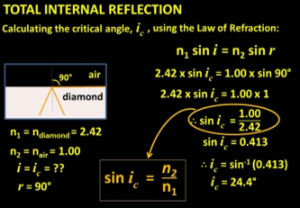 Total Internal Reflection is what makes, for example diamonds so sparkly, and reflectors so reflective. Without it we wouldn’t have any optical fibres to carry around our phone calls and our data. So what is it? 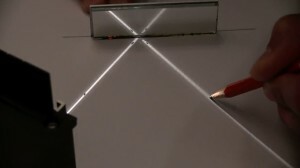 Total Internal Reflection is basically the total reflection of light from an internal surface of a substance when light strikes the internal surface at a high enough angle. It occurs even if the substance itself is otherwise transparent. Let’s have a look at Total Internal Reflection in a little more detail. Total Internal Reflection is basically the total reflection of light when, at a high enough angle, light strikes an internal surface of some material, even if the material itself is otherwise transparent. Let’s have a look at Total Internal Reflection in a little more detail. Now earlier on we saw how light refracts towards the normal when it slows down. We looked at angles of incidence of 0 degrees all the way up to 80 degrees for light going from air into water and from air into perspex. However, when light passes from say perspex to air it refracts away from the normal. Whenever light is going from a higher refractive index material to a lower refractive index material, like it’s doing here, the angle of refraction is greater than the angle of incidence. At some point the angle of refraction will reach 90 degrees, before the angle of incidence does. So what happens then? 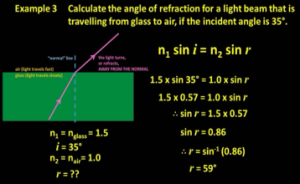 Here are some actual angles of incidence and angles of refraction of light moving from perspex to air. 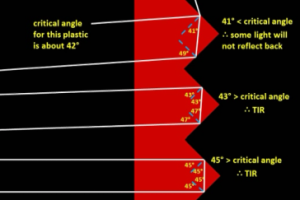 A 40 degree incident angle produces an angle of refraction of about 73 degrees. At a slightly higher angle, the refracted ray gets even closer to 90 degrees. But let’s now turn our attention to this light ray that’s reflecting from the internal surface of the perspex. As the angle of incidence increases, the angle of refraction also increases, but, importantly, more and more light reflects when it strikes the internal surface of the perspex and less and less exits the perspex. 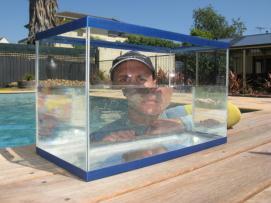 In this photo, the angle of refraction is about 85 degrees. As you can see, most, but not all, of the light is reflecting not refracting. Now at a certain angle, which for perspex is just under 42 degrees, the angle of refraction of the light ray, or what’s left of it, is 90 degrees. This angle is called the critical angle. 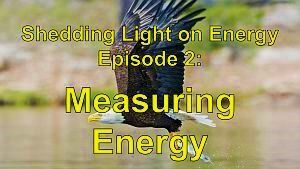 If we increase our angle of incidence any further, beyond this so-called critical angle, the light ray doesn’t refract at all, and it doesn’t emerge from the internal surface, but in fact undergoes what we call “Total Internal Reflection”. 100% of the incident light reflects back and none of it comes out of the perspex from this surface. It’s as if the internal surface has become a perfect mirror. This glass prism is completely see-through, but if light hits an internal surface at an angle greater than 42 degrees, the surface becomes a perfect mirror because of total internal reflection. We can see the two markers through the glass, but if I position the prism in a certain way, we can see that the light coming from the orange marker passes into the glass here but totally internally reflects from this surface which is acting like a mirror. The same thing is happening with the light coming from the blue marker. 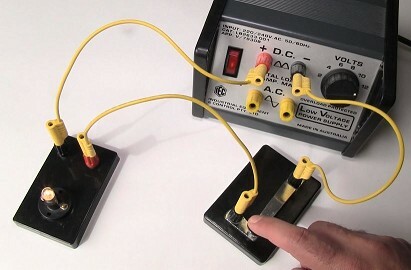 Here we can see that the perspex block is completely transparent, but if we move the light box shining the yellow light to this position, the light hits the internal surface of the perspex at an angle greater than the critical angle, so instead of passing through, it totally internally reflects. We can do the same thing with the other light beams as well. The critical angle, which is given the symbol ic or ?c, varies according to the refractive indexes of the two materials that the light is travelling in. 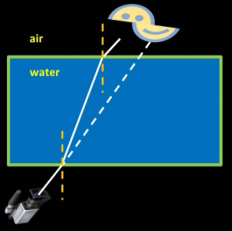 For light going from water, which has a refractive index of 1.33, into air, the critical angle is about 49 degrees. The critical angle for light going from perspex to air is, as we’ve just seen, about 42 degrees and it’s more or less the same for glass. The incident angle shown in both these photos is just below the critical angle. In diamond, which has a really high refractive index of 2.42, the critical angle for light moving towards the air is only about 24 degrees. Unfortunately, we couldn’t find a diamond big enough to show the critical angle in real life, but I will be showing you more about diamonds later on. 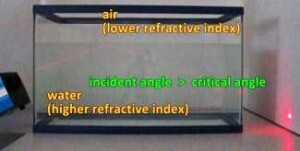 As you can see, the higher the refractive index, the lower the critical angle, but to be really accurate, I should say that the bigger the difference in the refractive indexes of the two materials, the lower the critical angle, since the critical angle is affected by both materials that the light is travelling in. So, when light rays travel from a higher refractive index material to a lower refractive index material they refract away from the normal. 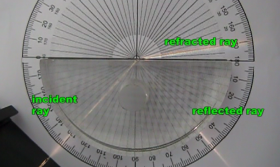 As the angle of incidence increases, the angle of refraction increases as well but more and more light reflects from the surface while less and less refracts. 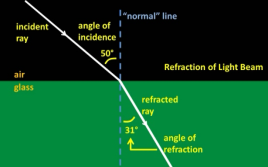 At a certain angle, called the critical angle, the light rays have refracted the maximum amount that they can. 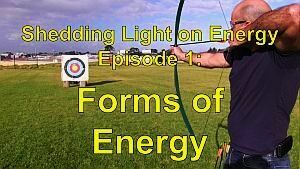 If the angle of incidence is increased any further, the light totally internally reflects from the inside surface. The surface becomes mirror like even though the material itself is normally transparent. Total internal reflection can only ever occur if the light is moving from a higher refractive index material towards a lower refractive index material. Here a laser beam is shining upwards into a fish tank with some dirty water in it. The dirt scatters some of the laser light which allows us to see its path. Since water has a higher refractive index than air and the light is hitting the undersurface of the water at an angle greater than the critical angle for water, which is 49 degrees, it totally internally reflects. 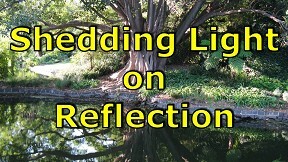 If light goes from air to water, some light will always reflect and some light will always enter the water and refract. It doesn’t matter what the incident angle is. If light goes from water to air and the angle of incidence is less than the critical angle, again some light will always reflect and some will always leave the water and refract. But, when light is moving in water towards air and it strikes at an angle greater than the critical angle, the light will not exit, but will totally internally reflect. 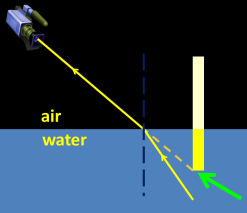 Part E: Examples of Total Internal Reflection. 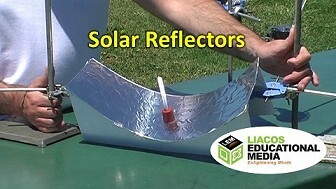 Total internal reflection is actually very common. So let’s have a look at a few examples of where it occurs. Here in a swimming pool, some of the light coming from my wetsuit that is travelling upwards totally internally reflects back down towards the underwater camera, so an upside down image forms. Because of total internal reflection, the undersurface of the water acts like a mirror. However, it’s obviously not a perfect mirror because of the ripples in the water. We’ve deliberately placed the camera just under the surface of the water, so that the light reflecting off me hits the undersurface of the water at a really large angle of incidence and then totally internally reflects into the camera. Red and white reflectors along the sides of country roads, and reflectors on bikes and cars, don’t use mirrors to reflect light, they use transparent plastic, but as we now know even a transparent material can act like a mirror if light hits its internal surfaces at an angle greater than the critical angle. The plastic is typically shaped with a series of zig zags angled at 45 degrees, and it’s these zigzags which are responsible for causing the reflection, even though the plastic is transparent. This light beam, coming from say a car’s headlight, passes into the plastic and then hits both internal surfaces at an angle of 45 degrees, which is greater than the plastic’s critical angle. The light therefore totally internally reflects and so reflects back towards the car where the driver can clearly see it. Of course in this case the reflector acts like a coloured filter and only red light is reflected, but we aren’t showing you this in our animation. At small angles the light will also reflect back towards the driver, but larger angles result in a lot of the light passing through the plastic because the angle of incidence within the plastic is less than the critical angle. Now if the light hits at a small angle, it also reflects back in the same direction, back, in other words, towards the driver’s eyes. If the angle gets too big though, then a lot of the light will pass through the plastic, because the angle of incidence within the plastic is less than the critical angle. But this doesn’t matter, because the reflector is designed only to reflect light back towards a driver whose car is pointing more or less towards the reflector. If the light hits at a small angle it will again reflect back in the direction it came from. If the periscopes on military submarines also make use of total internal reflection. You can make a simple periscope using ordinary mirrors to reflect light. However, periscopes used in submarines use glass prisms. The light enters the glass, hits the other side at an angle of about 45 degrees, which is more than the critical angle for glass and then totally internally reflects. You can see that these glass prisms are transparent, but when light beams strike their internal surfaces at an angle greater than the critical angle, they act like mirrors and reflect the light. Glass prisms are used as mirrors because you get a clearer picture. 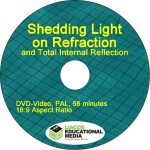 The light reflects only once where total internal reflection occurs. 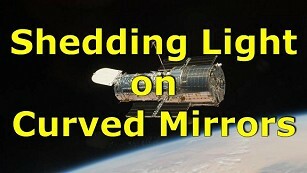 In a normal mirror, the light can reflect from the front surface of the glass and from the silver layer at the back which can produce a slightly blurry image. A submarine’s periscope is in fact also a telescope, so it doesn’t just use prisms, it uses lenses as well. 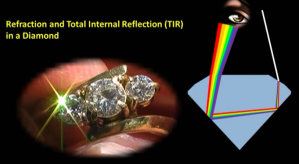 Total Internal Reflection is also responsible for making diamonds appear so bright and sparkly. Diamonds are actually transparent, but the high refractive index of diamond and the way diamonds are cut gives them a unique look. Many diamonds are cut into this shape here. There’s a crown at the top, a thin girdle, and a pavilion at the bottom. Each flat section is called a facet. The big facet at the top is called the table. By the way, what we’re looking at here is actually made of glass. A real diamond this big would be worth millions. When light shines onto a diamond, some of the light reflects off the crown surfaces but most of the light enters the diamond, refracting when it does, and then hits the lower facets on the pavilion. The diamond is cut to ensure that most of the light rays that hit the pavilion surfaces do so at an angle greater than the critical angle, which is about 24 degrees. The light rays totally internally reflect twice, and then re-emerge into the air. Slight movements of the diamond cause the light to refract by slightly different amounts and emerge from different facets, so the diamond appears to sparkle. A lot of science and mathematics goes into the design of diamonds. If the angles of the facets aren’t right, the light comes out through the bottom of the diamond, so it loses some of its sparkle. Now it’s pretty obvious that when viewed from certain angles, the diamond produces coloured light, which in the diamond trade is called the fire of the diamond. When light enters or exits the diamond it doesn’t just refract, it also disperses. As I said earlier, the colours that make up white light refract by slightly different amounts. By the time the light re-emerges into the air it’s often been dispersed enough so that if you look from say here, you see a flash of red, but if you look from here you see a flash of blue. Once again we’ve exaggerated the amount of dispersion in our animation. No other gemstone is able to totally internally reflect as much light as a diamond, and so together with the fact that diamonds are so hard and durable, they are among the most highly prized of all gemstones. 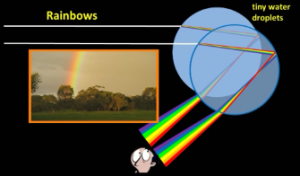 Now rainbows are formed almost exactly in the same way as what we’ve just seen. Refraction, dispersion and the internal reflection of light are all involved. We see a rainbow when the sun is behind us and there are droplets of water in front of us, usually up in the sky, but also in waterfalls and anywhere where you might have a spray of water. A lot of the light that hits a droplet of water goes straight through it, refracting as it does. But, the light that enters the drop of water from a certain angle not only refracts but also disperses into the colours of the rainbow and then internally reflects when it hits the back of the drop. It then refracts and disperses even more when it leaves the drop of water. If you were to stand here, only red light would enter your eyes, so you would see the raindrop as red. While this is happening, light is also doing much the same thing inside another rain drop. However, this second rain drop appears violet to the observer, because only the violet light is entering the observer’s eyes. In reality, the millions of droplets are tiny and, unlike what we’ve just shown in our animation, the ones that appear violet don’t overlap with the ones that appear red. These ones here appear red, these ones orange, these ones yellow and so on so you see a rainbow. Technically, a rainbow isn’t an actual thing that you can touch, and that’s actually there, it’s just the sunlight reflecting off water droplets. Someone standing next to you, sees the rainbow in a slightly different position to you, because the coloured light is coming from different drops of water. The angle between the sun, the water and your eye is about 42 degrees for the red part of the bow and about 40 degrees for the violet part of the bow. The reason that a circular bow forms is that all the raindrops along this curve are at just the right angle. Finally, probably the most important use of total internal reflection in everyday life is in optical fibres. Inside this optical fibre cable are a number of optical fibres. Optical fibres are extremely thin, flexible glass fibres which are used to carry data in the form of light beams from one place to another in communications networks. So, for example, when you talk to someone on your mobile phone, the sound of your voice is converted to an electrical signal by the phone which is then sent by radio waves to a tower. The radio-wave signal is converted back into an electrical signal which is then converted to a laser beam signal. The laser beams are sent down optical fibres to another tower, where the equipment then reconverts the signal first into an electrical signal and then into a radio wave which is then sent out to the phone of the person you’re talking to. Optical fibres also connect homes and businesses to telephone companies and to internet service providers. Here I’m shining a laser into some of the optical fibres inside the optical fibre cable, and you can see the laser light coming out of the other end. So how do they work? Well, there are different types of optical fibres, but let’s look at a simple example. An optical fibre has a super pure, glass core with a refractive index of 1.62. Surrounding the glass core is what’s called the glass cladding. This is a different type of glass which has a refractive index of 1.52. The core and the cladding have a combined diameter of only about 0.1 of a millimetre, about the width of a human hair, so they’re surrounded by various plastic layers to protect the glass. These delicate fibres are then bundled into cables. Most of an optical fibre cable is in fact the plastic used to protect the glass fibre. Undersea cables, like the Southern cross cable in the Pacific Ocean include steel wires and a copper tube for extra strength. Now if a light beam signal is shone into the core, it will soon hit the cladding, but it will typically hit at an angle that is greater than the critical angle for the boundary between the core and the cladding, so it will totally internally reflect back into the core. In this particular case, the critical angle between the core glass and the cladding glass is about 70 degrees. 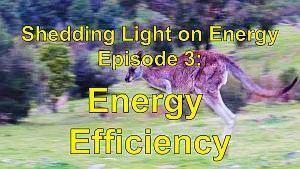 The light signal, which is actually made of a series of short pulses, billions of them per second, will then zig zag along until it gets to the other side, where it can be decoded by the electronic equipment. The cladding doesn’t carry any of the signal, it simply ensures that the light stays within the core. The cladding doesn’t carry any of the signal but because the light spreads out as it moves down the fibre, it does allow any part of the pulse that ends up zig zagging too much to leave the core, which means more bits of data can be sent down the fibre per second. I can demonstrate what happens in an optical fibre by shining light into a row of perspex blocks. The light totally internally reflects when it hits the inside surface of the perspex, because it’s hitting at an angle greater than the critical angle. I can simulate a bend in the fibre by adding a triangular block. The glass blocks act like a solid, light-carrying tube. The zig zag path shown here is much more pronounced though than the path of a light beam moving in an actual optical fibre which is really, really thin. Optical fibres can carry thousands of television channels and millions of phone calls all at the same time, and without them, global, high-speed internet connections just wouldn’t be possible. I can also use a stream of water to demonstrate how an optical fibre works. This laser is shining light through the water. When the laser light hits the internal surfaces of our stream of water, it totally internally reflects and so it follows the curvature of the water. Because of the water’s turbulence, a lot of the light ends up escaping the water fairly quickly. This doesn’t happen of course with optical fibres. In this little decorative Christmas tree, light shines upwards from an LED at the base of the tree into a bunch of glass fibres. The light totally internally reflects its way up each fibre and eventually comes out at the other end creating an interesting lighting effect. A similar use of glass fibres is used in endoscopes, which employ glass fibres which carry light in and out of a patient’s body, allowing doctors to look into their patients’ bodies without making huge incisions. The narrow tube can be inserted through a small incision, or directly into the lungs or stomach for example. So there you have it. Refraction and Total Internal Reflection. What wonderful things. So, having watched “Shedding Light on Refraction”, you should now know, if you didn’t already, that light rays refract when they pass from one substance to another. We measured angles of incidence and angles of refraction, for both water and perspex, and saw that light refracts more in perspex than it does in water. But, for any given angle of incidence, is there a way of calculating what the angle of refraction would be without actually measuring it? Well, yes there is. Mathematics, of course, is a very powerful scientific tool. 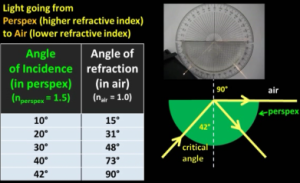 Before we begin though, let’s take another quick look at refractive index. 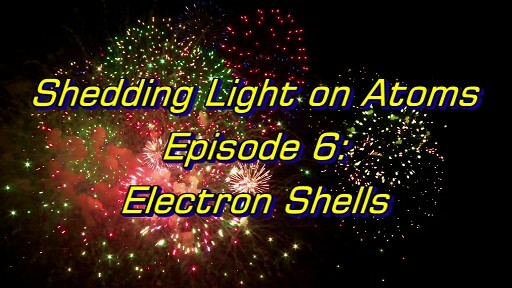 We’ve already seen that light travels at different speeds in different substances. By the way, scientists often use the word “medium” when they’re talking about the stuff that light or any kind of wave, is travelling through. The plural of medium is media. The refractive index of a substance, given the symbol “n”, equals the speed of light in a vacuum divided by the speed of light in the substance. It’s really easy to calculate. The refractive index of water for example, equals 300,000km/s / 225,000km/s which equals 1.33. The same calculation can be performed for any medium. For a vacuum and air the refractive index is 1. 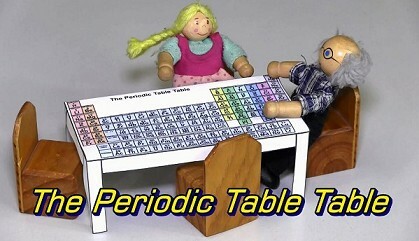 As you’ve no doubt realized by now, science is full of symbols and terminology. Scientists often use the lower case “c” to denote the speed of light, (which is to be exact 299,792,458 m/s) so that we can re-write the equation as the refractive index of the medium = c divided by the speed of light in that medium. Sometimes the equation is written as n = c / v, where v is the velocity, or speed, of light in that medium. And one more bit of terminology before we move on. An expression I haven’t used, but that you might come across, is “optical density”. It’s basically the same as refractive index, but it’s not used in equations. Someone might say, for example, that diamond is more optically dense than water. Optical density has nothing to do with physical density. 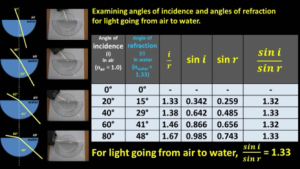 Let’s now examine some angles of incidence and angles of refraction of light passing from air into water and see if we can come up with some kind of mathematical relationship between them. At first glance, there doesn’t seem to be much of a pattern. The angle of refraction first changes from 0 to 15 degrees, which is a change of 15, then there’s a change of 14, then 12, then 7. Hardly helpful. If we extend our table and calculate the angle of incidence divided by the angle of refraction, we also don’t really come up with a pattern. However, ignoring the first row, if we calculate the sine of the incident angle (as in sin, cos and tan) and then the sine of the angle of refraction, and then divide sin i by sin r, we get 1.32. If we continue doing this for all the values of i and r, we find that the values of sini over sinr are all much the same: close enough to 1.33, which, not co-incidentally, is the refractive index of water. We now have a relationship: for light going from air to water, sini / sin r = 1.33, every time. If we do the same with perspex, we would find that the sin of every angle of incidence divided by the sine of its corresponding angle of refraction would equal 1.5, which is the refractive index of perspex. 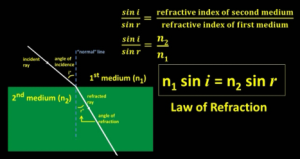 So, we can write a simple equation to put it all together, For light travelling from air into some other medium, sin i / sinr = the refractive index of that medium. This relationship was first determined about a thousand years ago in what was then called Persia by the Persian scientist Ibn Sahl. However, I haven’t yet told you, quite the whole story. It turns out that sin i / sinr equals the refractive index of the second medium divided by the refractive index of the first medium. Since the refractive index of air is 1, it didn’t show up in our data. So, for light travelling from the first substance with a refractive index of n1 to the second substance with a refractive index of n2, we can write the equation, sini / sinr = n2 / n1. Rearranging, gives us n1 sin i = n2 sin r. The equation is often called Snell’s Law after the Dutch scientist Willebrord Snell, who independently re-discovered the mathematical relationship in the 1600s, but it’s often simply called the Law of Refraction. Now even though I started with the equation (refractive index = the speed of light in a vacuum / the speed of light in the medium), the concept of refractive index and the Law of Refraction actually came way before scientists had any idea about how fast light travels. But let’s not discuss that right now. Let’s instead look at three examples of light beams refracting and try to do some calculations. Here is a screen grab for one of the examples. 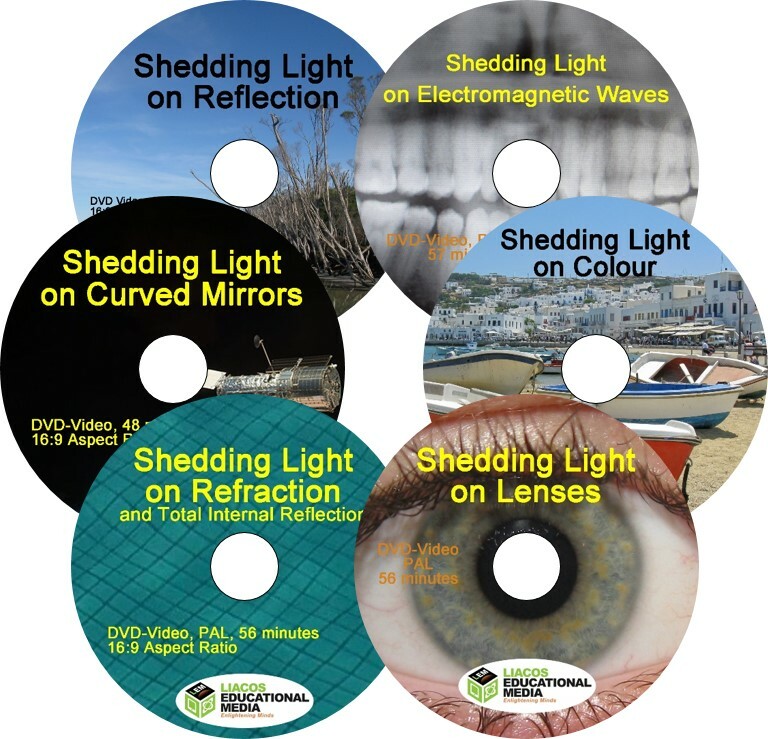 While these examples might seem fairly trivial, a good knowledge of the Law of Refraction has been absolutely essential in the design of lenses, optical fibres and a host of other optical devices. In all of our examples, air has been one of the substances through which light travels, but of course that won’t always be the case. And remember, you can learn a lot from teachers, from videos and from reading, but you usually learn even more when you practise things for yourself. Thanks to AFC Group (Australian Fibreoptic Communications) (http://www.afcgroup.com.au/). Right Bronchial Tree.ogg (http://commons.wikimedia.org/wiki/File:Right_Bronchial_Tree.ogg) by http://www.pneumevah.gr is licensed under CC BY-SA 3.0. Iatrogenic-post-intubation-tracheal-rupture-treated-conservatively-without-intubation-a-case-report-1757-1626-1-259-S1.ogv (http://commons.wikimedia.org/wiki/File:Iatrogenic-post-intubation-tracheal-rupture-treated-conservatively-without-intubation-a-case-report-1757-1626-1-259-S1.ogv) by Prunet B, Lacroix G, Asencio Y, Cathelinaud O, Avaro J, Goutorbe P is licensed under CC BY 2.0. 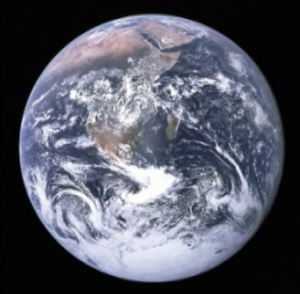 Image of the Earth created by NASA. 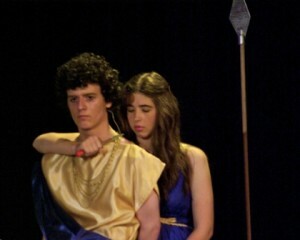 Written, directed and presented by Spiro Liacos. Do you need more information? Do you want copies of the answer sheets? Feel free to contact us!